My start in vector illustration began only last year, but it has become one of my favorite new art forms and hobbies. I have particularly enjoyed doing vector cartoon caricatures of people, in what has been called "chibi" formats. I have done illustrations in this style as caricatures of actual people (as in my Mia Zoe illustration), fan arts of existing characters (as in Alice from "Alice in Wonderland,"), and most enjoyably, of original characters created by myself such as my illustrations of my first 'OC,' Laila. I shared some of my chibi vectors in a post last year, but I had yet to share these illustrations in my blog (except for "Painting the Roses Red," which was featured previously) so I am glad to be sharing these character and caricature illustrations now. Some are done in all vector format (no raster or Photoshop styling) while others have used both vector and raster elements, specific details are given for each illustration. Click to view full size images. This vector remains my most popular illustration (as far as favorites go) on deviantART, which is why I am showing it here again. This was my very first attempt at such an illustration. It containins both vector and raster elements. 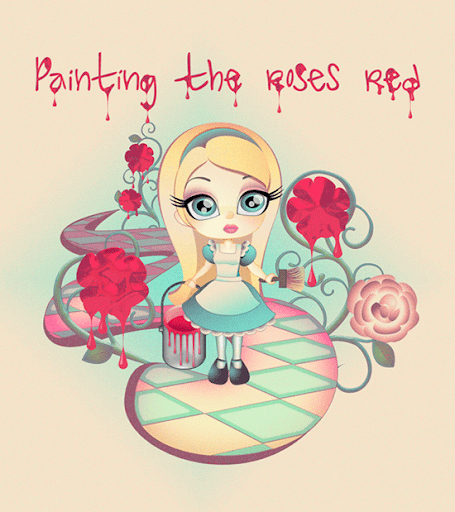 I have no idea how she managed to keep her paintbrush so clean after painting all of those roses. This is an all vector illustration I created as a caricature of my 'reallife' friend, the talented developer and designer Miss Mia Zoe. Here is my own personal favorite of my illustrations of my original character, Laila. 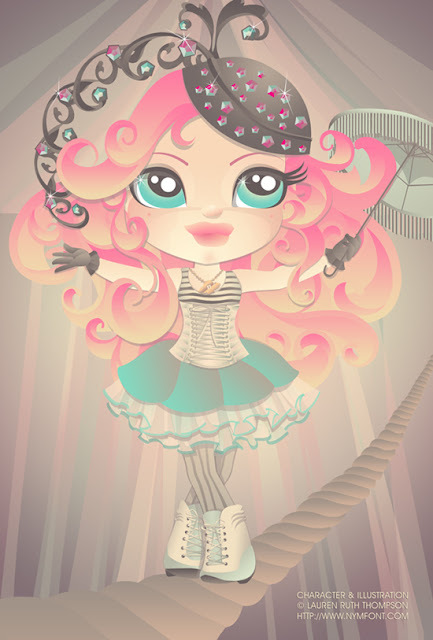 Here she is emulating Britney Spears in her Circus album art, hence the title of the illustration being a play on the title of Britney's song, "Oops! I Did It Again." This is an all vector illustration, which took me several overs over a course of several days to complete. Some more illustrations of Laila can be seen in this post. This illustration is an all vector re-work and new rendition of Laila in her signature pose from my very first illustration of her. The typeface used for the titling is called Voivode and is courtesy of the font and type master Ray Larabie of the foundry Typodermic. View the original rendition and first illustration of Laila in this post. Additional illustrations of Laila can be seen in this post as well. I would love to hear your feedback on my illustrations, so feel free to share your thoughts on them with a comment. I have enjoyed creating them and plan to create more in the future as well. View more of my illustrations and other artwork on deviantART.